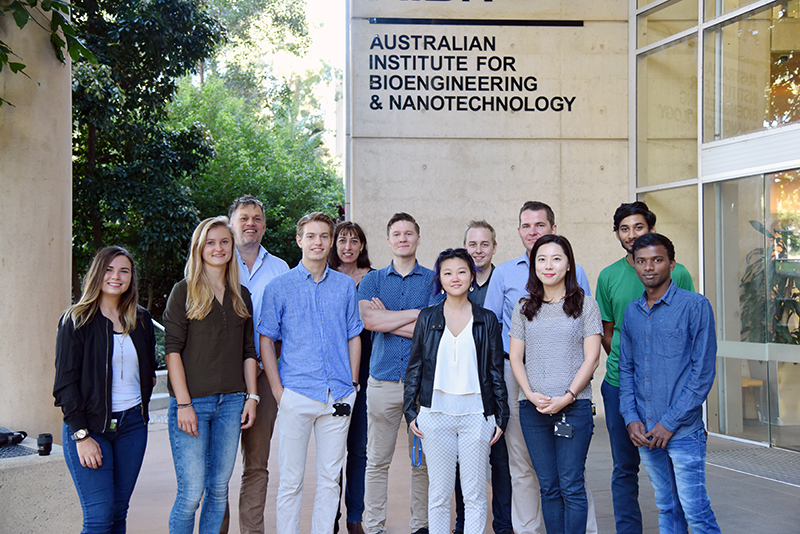 The multidisciplinary Biomaterials Group, led by AIBN Director and ARC Laureate fellow Professor Alan Rowan, brings together the seemingly distant disciplines of physics material- and bio- sciences to understand the intricacies of cell behaviour and their extracellular environments. Comprised of scientists with backgrounds in cell biology, chemistry, physics and materials science the Biomaterials Group tackles the fundamental biophysical questions behind cell and extracellular matrix behaviour. With access to state-of-the-art equipment within the group and in AIBN, we are taking the challenge of understanding how exactly the material properties of the extracellular matrices are translated into intracellular response and signalling. For this reason, we are focused on the synthesis of synthetic polymeric, well-defined natural and hybrid matrices and the development of methodologies on how to study the cell–material interactions in close detail. Polyisocyanopeptide based polymers mimic the mechanical responsiveness of biological matrices providing opportunities to create synthetic matrices for biological and medical applications. Creation of stem cell 3D microenvironments using polyisocyanopeptide based hydrogel demonstrates importance of stress-stiffening parameters in guiding stem cell fate. Antibody-functionalized polyisocyanopeptide hydrogel can effectively mimic the endogenous dendritic cell activation of T-Cells for use in cancer immunotherapy development. Cells are able to sense and respond to external mechanical stimuli from their surrounding extracellular matrix (ECM) via a process called mechanotransduction. Honours Project: Investigation of the early inflammatory responses to haemostatic agents used to control bleeding. Wound healing is a coordinated and overlapping series of biological events responding to the site of injury. Honours Project: Creating a portable efficacious haemostatic agent to control bleeding based on potent recombinant snake venom proteins. Wound healing is a coordinated and overlapping series of biological responses to the injury, where the first stage is haemostasis, the control of bleeding. Over 5 million people a year die from major trauma injuries globally. In the fields of biomimetic catalysis and functional materials, our group has had the privilege of working with some of world’s best departments and institutes: ISIS Strasbourg, Imperial College London, Cambridge University and Oxford University, Max Plank Mainz Germany and KULeuven Belgium, all renowned Centres of academic excellence. This includes collaborations with, and mentorship from, leading figures in the field such as Prof C.A. Hunter, Prof R.J.M Nolte, Prof R. Friend, Prof K. Muellen and Nobel Laureate Prof J.M. Lehn. Key international collaborators include; Prof. M. Stevens (Imperial College, London), Prof. F. Macintosh (UVA Amsterdam), Prof O. Ikkala (University of Helsinki), Prof J. Hofkens (KULeuven Belgium), Prof M. Mueller (Aachen Germany), Dr. Kerstin Blank (Max Plank Institute, Potsdam), Prof. Stefan Egelhaaf (HHU, Dusseldorf). In addition to academic collaboration our group is also involved in collaborations with industrial partners, NovioTech and NovioSense (Nijmegen, The Netherlands). Akeroyd, N.; Nolte, R.J.M. ; Rowan, A.E., Polyisocyanides, Isocyanide Chemistry (2012), 551–585. Veling, N.; Elemans, J.A.A.W. ; Nolte, R.J.M. ; Rowan, A.E. Ordered surface structures of self-assembled porphyrins; Ed. Kadish, K.M. ; Smith, K.M. ; Guilard, R. Handbook of Porphyrin Science (2012), 18, 1–56. Elemans, J.A.A.W. ; Rowan, A.E. ; Nolte, R.J.M. Processive rotaxane catalysts Ed. By:Harada, A. Supramolecular Polymer Chemistry (2012), 185–193. Kitto, H.J. ; Lauko, J.; Rutjes, F.P.J.T. ; Rowan, A.E. Click chemistry in the preparation of biohybrid Materials Ed. By: Lahann, J. Click chemistry for biotechnology and materials science, (2009), 217–254. Otten, M.B.J. ; Metselaar, G.A. ; Cornelissen, J.J.L.M. ; Rowan, A.E. ; Nolte, R.J.M. Polyisocyanides: Stiffened foldamers. Foldamers (2007), 367–402. Elemans, J.A.A.W. ; Rowan, A. E.; Nolte, R.J.M. Glycoluril-based hosts Encyclopaedia of Supramolecular Chemistry, Ed. By: Attwood, J. and Steed, J. (2005). Courmans, R.; Rowan, A.E. ; Molecular Switches, Encyclopaedia of Supramolecular Chemistry, Ed. By: Attwood, J. and Steed, J. (2005). Vanoppen, P.; Hofkens, J.; Latterini, L.; Jeuris, K.; Faes, H.; Kerimo, J.; Barbera, P.F. ; Rowan, A.E. ; Nolte, R.J.M. ; De Schrijver, F.C. Excited state probing the supramolecular systems on a submicron scale, Appl. Fluoresc. Chem., Biol. Med. Ed. By: Retting, W.; Strehmel, B. Schrader, S. (1999), 119–136. Vanoppen, P.; Latterini, L.; Jeuris, K.; Hofkens, J.; De Schrijver, F.C. ; Blossey, R.; Kerimo, J.; Barbera, P.F. ; Rowan, A.E. ; Nolte, R.J.M. Space resolved study of porphyrin rings: local optical properties and formation mechanism, Mesoscopic Chemistry, Ed. By: Masuhara, H.; De Schrijver, F.C. (1999), 75–87. Abraham, R.J. and Rowan, A.E. Nuclear Magnetic Resonance Spectroscopy of Chlorophyll, Ed. By: Scheer, H. (1991), 797–834. Schoenmakers, D.C, Schoonen, L., Rutten, M.G.T.A., Nolte, R.J.M., Rowan, A.E., van Hest, J.C.M., Kouwer, P.H.J. Virus-like particles as crosslinkers in fibrous biomimetic hydrogels: approaches towards capsid rupture and gel repair, Soft Matter (2018), 14, 1442–1448. Zimoch, J., Padial, J.S., Klar, A.S., Vallmajo-Martin, Q., Meuli, M., Biedermann, T., Wilson, C.J., Rowan, A.E., Reichmann, E. Polyisocyanopeptide hydrogels: A novel thermo-responsive hydrogel supporting pre-vascularization and the development of organotypic structures, Acta Biomaterialia, 2018, j.actbio.2018.01.042. de Poel, W., Münninghoff, J.A.W., Elemans, J.A.A.W., van Enckevort, J.W.P., Rowan, A.E., Vlieg, E. Surfaces with Controllable Topography and Chemistry Used as a Template for Protein Crystallization, Cryst. Growth Des. (2018), 18, 763–769. Kouwer, P.H.J., de Almeida, P., van den Boomen, O., Eksteen-Akeroyd, Z.H., Hammink, R., Jaspers, M., Kragt, S., Mabesoone, M.F.J., Nolte, R.J.M., Rowan, A.E., Rutten, M.G.T.A., Le Sage, V.A.A., Schoenmakers, D.C., Xing, C., Xu, J.L. Controlling the gelation temperature of biomimetic polyisocyanides, Chin. Chem. Lett., (2018), 29, 281–284. Li, X.Y., Semin, S., Estrada, L.A., Yuan, C.Q., Duan, Y.L., Cremers, J., Tinnemans, P., Kouwer, P.H.J., Rowan, A.E., Rasing, T., Xu, J.L. Strong optical nonlinearities of self-assembled polymorphic microstructures of phenylethynyl functionalized fluorenones, Chin. Chem. Lett. (2018), 29, 297–300. Yuan, H., Xu, J., Van Dam, E.P., Giubertoni, G., Rezus, Y.L.A., Hammink, R., Bakker, H.J., Zhan, Y., Rowan, A.E., Xing, C., Kouwer, P.H.J. Strategies to Increase the Thermal Stability of Truly Biomimetic Hydrogels: Combining Hydrophobicity and Directed Hydrogen Bonding, Macromolecules (2017), 50, 9058–9065. de Poel, W., Vaessen, S.L., Drnec, J., Engwerda, A.H.J., Townsend, E.R., Pintea, S., de Jong, A.E.F., Jankowski, M., Carlà, F., Felici, R., Elemans, J.A.A.W., van Enckevort, W.J.P., Rowan, A.E., Vlieg, E. Metal ion-exchange on the muscovite mica surface, Surface Science (2017), 665, 56–61. Hammink, R., Eggermont, L.J., Zisis, T., Tel, J., Figdor, C.G., Rowan, A.E., Blank, K.G. Affinity-Based Purification of Polyisocyanopeptide Bioconjugates, Bioconjugate Chem. (2017), 28, 2560–2568. Deshpande, S.R., Hammink, R., Nelissen, F.H.T., Rowan, A.E., Heus, H.A. Biomimetic Stress Sensitive Hydrogel Controlled by DNA Nanoswitches, Biomacromolecules (2017), 18, 3310–3317. de Poel, W., Gasseling, A., Mulder, P., Steeghs, A.P.G., Elemans, J.A.A.W., van Enckevort, W.J.P., Rowan, A.E., Vlieg, E. Noble metal surface degradation induced by organothiols, Surface Science (2017), 662, 59–66. Keshavarz, M., Engelkamp, H., Xu, J., Van Den Boomen, O.I., Maan, J.C., Christianen, P.C.M., Rowan, A.E. Confining Potential as a Function of Polymer Stiffness and Concentration in Entangled Polymer Solutions, J. Phys. Chem. B (2017), 121, 5613–5620. Jaspers, M., Vaessen, S.L., Van Schayik, P., Voerman, D., Rowan, A.E., Kouwer, P.H.J. Nonlinear mechanics of hybrid polymer networks that mimic the complex mechanical environment of cells, Nat. Commun. (2017), 8, 15478. Hammink, R., Mandal, S., Eggermont, L.J., Nooteboom, M., Willems, P.H.G.M., Tel, J., Rowan, A.E., Figdor, C.G., Blank, K.G. Controlling T-Cell Activation with Synthetic Dendritic Cells Using the Multivalency Effect, ACS Omega (2017), 2, 937–945. Lauko, J.; Kouwer, P.H.J. ; Rowan, A.E. 1H-1,2,3-Triazole: From Structure to Function and Catalysis, J. Heterocycl. Chem. (2017), 54, 1677–1699. Feenstra, J., Van Eerden, M., Lemmens, A.K., De Poel, W., Kouwer, P.H.J., Rowan, A.E., Schermer, J.J. Muscovite mica as a growth template of PC61BM crystallites for organic photovoltaics, CrystEngComm (2017), 19, 4424–4436. van den Boomen, O.I., Coumans, R.G.E., Akeroyd, N., Peters, T.P.J., Schlebos, P.P.J., Smits, J., de Gelder, R., Elemans, J.A.A.W., Nolte, R.J.M., Rowan, A.E. Carbenoid transfer reactions catalyzed by a ruthenium porphyrin macrocycle, Tetrahedron (2017), 73, 5029–5037. Chervy, T.; Xu, J.L. ; Duan, Y.L. ; Wang, C.L. ; Mager, L.; Frerejean, M.; Munninghoff, J.A.W. ; Tinnemans, P.; Hutchison, J.A. ; Genet, C.; Rowan, A.E. ; Rasing, T.; Ebbesen, T.W. High-Efficiency Second-Harmonic Generation from Hybrid Light Matter States, Nano Lett. (2016), 16, 7352–7356. *Deshpande, S.R. ; Hammink, R.; Das, R.K.; Nelissen, F.H.T. ; Blank, K.G. ; Rowan, A.E. ; Heus, H.A. ; DNA-Responsive Polyisocyanopeptide Hydrogels with Stress-Stiffening Capacity, Adv. Funct. Mater., (2016), 26, 9075–9082. *Alvarez Fernandez, A.; Hammink, R.; Kragt, S.; Cattaneo, L.; Savoini, M.; van der Velden, J.; Rasing, T.; Rowan, A.E. ; Collings, P.J. ; Kouwer, P.H.J. Order at Extreme Dilution, Adv. Funct. Mater., (2016), 26, 9009–9016. Duan, Y; Ju, C.; Yang, G.; Fron, E.; Coutino-Gonzalez, E.; Semin, S.; Fan, C.; Balok, R.S. ; Cremers, J.; Tinnemans, P.; Feng, Y.; Li, Y.; Hofkens, J.; Rowan, A.E. ; Rasing, T.; Xu, J.L. Aggregation Induced Enhancement of Linear and Nonlinear Optical Emission from a Hexaphenylene Derivative, Adv. Funct. Mater., (2016), 26, 8968–8977. Xu, J.L. ; Liu, X.Y. ; Rowan, A.E. ; Rasing, T. Advances in Soft Functional Materials Research, Adv. Funct. Mater., (2016), 26, 8807–8809. Lauko, J.; Kouwer, P.H.J. ; Rowan, A.E. 1H-1,2,3-Triazole: From Structure to Function and Catalysis, J. Heterocycl. Chem., (2016), DOI: 10.1002/jhet.2770. Ramos, P.H. ; Saisaha, P.; Elemans, J.A.A.W. ; Rowan, A.E. ; Nolte, R.J.M. Conformational Analysis and Binding Properties of a Cavity Containing Porphyrin Catalyst Provided with Urea Functions, Eur. J. Org. Chem. (2016), 4487–4495. *Jaspers, M.; Pape, A.C.H. ; Voets, I.K. ; Rowan, A.E. ; Portale, G.; Kouwer, P.H.J. Bundle Formation in Biomimetic Hydrogels, Biomacromolecules (2016), 17, 2642–2649. *Zinkevich, T.; Venderbosch, B .; Jaspers, M.; Kouwer, P.H.J. ; Rowan, A.E. ; van Eck, E.R.H. ; Kentgens, A.P.M. Solid-state NMR characterization of tri-ethyleneglycol grafted polyisocyanopeptides, Magn. Res. Chem. (2016), 54, 328–333. *Das, R.K.; Gocheva, V., Hammink, R., Zouani, O. F.; Rowan, A. E Stress-stiffening-mediated stem-cell commitment switch in soft responsive hydrogels, Nature Materials (2016), 15, 318–325. *Bruekers, S.M.C. ; Jaspers, M.; Hendriks, J.M.A. ; Kurniawan, N.A. ; Koenderink, G.H. ; Kouwer, P.H.J. ; Rowan, A.E. ; Huck, W.T.S. Fibrin-fiber architecture influences cell spreading and differentiation, Cell Adh. Migr. (2016), 10, 495–504. *Dennison, M.; Jaspers, M.; Kouwer, P.H.J. ; Storm, C.; Rowan, A.E. ; MacKintosh, F.C. Critical behaviour in the nonlinear elastic response of hydrogels Soft Matter, (2016), 12, 6995–7004. Cattaneo, L.; Kos, Ž.; Savoini, M.; Kouwer, P.H.J. ; Rowan, A.E. ; Ravnik, M.; Muševič, I.; Rasing, T. Electric field generation of Skyrmion-like structures in a nematic liquid crystal, Soft Matter, (2016), 12, 853–858. *Keshavarz, M.; Engelkamp, H.; Xu, J.; Braeken, E.; Otten, M.B.J. ; Uji-i, H., Schwartz, E.;Koepf, M.; Vananroye, A.; Vermant, J. Nolte, R.J.M. De Schryver, F.C. Maan, J.C.; Hofkens, J. Christianen, P.C.M. ; Rowan A.E. Nanoscale study of polymer dynamics ACS Nano, (2016), 10, 1434–1441. Xu, J.L. ; Semin, S.; Cremers, J.; Wang, L.J. ; Savoini, M.; Fron, E.; Coutino, E.; Chervy, T.; Wang, C.L. ; Li, Y.J. ; Liu, H.B. ; Li, Y.L. ; Tinnemans, P.; Kouwer, P.H.J. ; Ebbesen, T.W. ; Hofkens, J.; Beljonne, D.; Rowan, A.E. ; Rasing, T. Controlling Microsized Polymorphic Architectures with Distinct Linear and Nonlinear Optical Properties, Adv. Optical Mater. (2015), 3, 948–956. Thomassen, P.J. ; Varghese, S.; Bijsterveld, E.J.A. ; Thordarson, P.; Elemans, J.A.A.W. ; Rowan, A.E. ; Nolte, R.J.M. A Double-Cavity-Containing Porphyrin Host as a Highly Stable Epoxidation Catalyst, Eur. J. Org. Chem., (2015), 5246–5253. Cantekin, S.; Markvoort, A.J. ; Elemans, J.A.A.W. ; Rowan, A.E. ; Nolte, R.J.M. Allosterically Controlled Threading of Polymers through Macrocyclic Dimers, J. Am. Chem. Soc., (2015), 3915–3923. Xu, J.L. ; Semin, S.; Rasing, T.; Rowan, A.E. Organized Chromophoric Assemblies for Nonlinear Optical Materials: Towards (Sub)wavelength Scale Architectures, Small, (2015), 11, 1113–1129. Varghese, S., Elemans, J.A.A.W., Rowan A.E. and J. M. Nolte R.J.M. Molecular computing: paths to chemical Turing machines Chem. Sci., (2015), 6, 6050–6058. Zisis, T., , P.L., Turunen, P., van Teeseling, M.C. F., Rowan, A.E., and K.G., Interfacial Activation of Candida antarctica Lipase B: Combined Evidence from Experiment and Simulation Biochemistry, (2015), 54, 5969–5979. Deutman, A.B.C; Varghese S.; Moalin, M.; Elemans, J.A.A.W. ; Rowan A.E., Nolte, R.J.M. Slippage of a Porphyrin Macrocycle over Threads of Varying Bulkiness: Implications for the Mechanism of Threading Polymers through a Macrocyclic Ring Chem. Eur. J., (2015), 360–370. *Mandal, S., Hammink, R., Tel, J., Eksteen-Akeroyd, Z. H., Rowan, A. E., Blank, K., Figdor, C. Polymer-based synthetic dendritic cells for tailoring robust and Multifunctional T cell responses. ACS Bio 2015, 10 (2), 485–492. *Jaspers, M.; Rowan, A.E. ; Kouwer P.H.J. Tuning Hydrogel Mechanics Using the Hofmeister Effect, Adv. Funct. Mater. (2015), 25, 6503–6510. *Nagelkerke, A.; Bussink J.; Rowan A.E., Span P., The mechanical microenvironment in cancer: how physics affects tumors Semin. Cancer Biol. (2015), 35, 62–70. Feenstra, J.; Six, I.F. ; Asselbergs, M.A.H. ; van Leest, R.H.; de Wild, J.; Meijerink, A.; Schropp, R.E.I. ; Rowan, A.E. ; Schermer, J.J. Er3+/Yb3+ upconverters for InGaP solar cells under concentrated broadband illumination, Phys. Chem. Chem. Phys., (2015), 17, 11234–11243. de Torres, M.; Semin, S.; Razdolski, I.; Xu, J.L. ; Elemans, J.A.A.W. ; Rasing, T.; Rowan, A.E. ; Nolte, R.J.M. Extended pi-conjugated ruthenium zinc-porphyrin complexes with enhanced nonlinear-optical properties, Chem. Commun., (2015), 51, 2855–2858. S. F. M. van Dongen, S. Cantekin, J. A. A. W. Elemans, A. E. Rowan and R. J. M. Nolte Functional interlocked systems Chem. Soc. Rev., (2014), 43, 99–122. W. de Poel, S. Pintea, J. Drnec, F. Carla, R. Felici, P. Mulder, J. A.A.W. Elemans, W. J.P. van Enckevort, A. E Rowan, E. Vlieg, Muscovite mica: Flatter than a pancake. Surface Science, (2014), 619, 19–24. Van Dongen, S.F.M. ; Elemans, J.A.A.W. ; Rowan, A.E. ; Nolte R.J.M. Processive Catalysis Angew. Chem. Int. Ed. (2014), 53, 11420–11428. Deutman, A.B.C; Smits, J.M.M. ; de Gelder, R.; Elemans, J.A.A.W. ; Nolte, R.J.M. Rowan A.E. Strong Induced‐Fit Binding of Viologen and Pyridine Derivatives in Adjustable Porphyrin Cavities Chem. Eur. J. (2014), 20, 11574­–11583. Hameren, R. van; Buul, A.M. van; Visser, D; Heenan, R.K.; King, S.M. ; Rowan, A.E. ; Nolte, R.J.M. ; Pyckhout-Hintzen, W.; Elemans, J.; Feiters, M.C. Solution scattering studies of the hierarchical assembly of porphyrin trimers based on benzene triscarboxamide, Soft Matter, (2014), 10, 9688–9694. Deutman, A.B.C; Cantekin, S.; Elemans, J.A.A.W. ; Rowan A.E. ; Nolte, R.J.M. Designing processive catalytic systems. Threading polymers through a flexible macrocycle ring J. Am. Chem. Soc., (2014), 136, 9165–9172. Deutman, A.B.C; Woltinge,T. ; Smits, J.M.M. ; de Gelder, R.; Elemans, J.A.A.W. ; Nolte, R.J.M. Rowan A.E. Thermodynamics and Kinetics of Guest-Induced Switching between “Basket Handle” Porphyrin Isomers, Molecules, (2014), 19, 5278­–5300. *Jaspers, M.; Dennison, M.; Mabesoone, M. F. J.; MacKintosh, F.C. ; Rowan, A.E. ; Kouwer P.H.J. Strain-stiffening hydrogels: Ultra-responsive soft matter Nature Comm., (2014), 5, 5808. Poel, W. de; Pintea, S.; Jong, A. de; Drnec, J.; Carla, F.; Felici, R.; Camp, H.J.M. op den; Elemans, J.A. ; Enckevort, W.J. van; Rowan, A.E. ; Vlieg, E. Dibenzo crown ether layer formation on muscovite mica Langmuir, (2014), 30, 12570–12577. *Dennison, M.; Jaspers, M.; Kouwer, P.H.J. ; Storm, C.; Rowan, A.E. and MacKintosh, F.C. Observation of critical behavior in the elastic response of hydrogels. arXiv 2014, 1407.0543. Turunen, P. Rowan, A.E. K. Blank, K. Single-enzyme kinetics using fluorogenic substrates: lessons learnt and future perspectives, FEBS Letters, (2014), 588, 3553–3563. *Koepf, M.; Kitto, H.J. ; Schwartz, E.; Kouwer, P.H.J. ; Nolte, R.J.M. ; Rowan, A.E. Preparation and characterization of non-linear poly(ethylene glycol) analogs from oligo(ethylene glycol) functionalized polyisocyanopeptides, Eur. Polymer J. (2013), 49(6), 1510-1522. Xu, J.L; Semin, S.; Niedzialek, D.; Kouwer, P.H.J. ; Fron, E.; Coutino, E.; Savoini, M.; Li, Y.; Hofkens, J.; Uji-I, H.; Rasing T.; Rowan A.E., Self-Assembled Organic Microfibers for Nonlinear Optics, Adv.Mat. (2013), 25(14), 2084-2089. Cattaneo, L.; Kouwer, P. H. J.; Rowan, A. E.; Rasing, T. Sub-millisecond nematic liquid crystal switches using patterned command layer. J. App.Physics (2013), 113(1), 014503/1-014503. Coumans, R.G.E. ; Elemans, J.A.A.W. ; Rowan, A.E. ; Nolte, R.J.M. Interlocked Porphyrin Switches Chem. Eur. J. (2013), 19(24), 7758-7770. *Kouwer, P.H.J. ; Koepf, M.; Le Sage, V.A.A. ; Jaspers, M.; van Buul, A.M.; Eksteen-Akeroyd, Z.H. ; Woltinge, T.; Schwartz, E.; Kitto, H.J. ; Hoogenboom, R.; Nolte, R.J.M. ; Rowan A.E. ; Responsive biomimetic networks from polyisocyanopeptide hydrogels, Nature (2013), 493(7434), 651-655. Jawalekar, A.M.; Malik, S.; Verkade, J.M.M. ; Gibson, B.; Barta, N.S. ; Hodges, J.C.; Rowan, A.E. ; van Delft, F.L., Oligonucleotide tagging for copper-free click conjugation, Molecules (2013), 18, 7346-7363.
den Boer, D.; Li, M.; Habets, T.; Iavicoli, P.; Rowan, A.E. ; Nolte, R.J.M. ; Speller, S.; Amabilino, D.B. ; De Feyter, S.; Elemans, J.A.A.W. Detection of different oxidation states of individual manganese porphyrins during their reaction with oxygen at a solid/liquid interface Nature Chemistry (2013), 5(7), 621-627. *van Buul, A.M.; Schwartz, E.; Brocorens, P.; Koepf, M.; Beljonne, D.; Maan, J.C.; Christianen, P.C.M. ; Kouwer, P.H.J. ; Nolte, R.J.M. ; Engelkamp, H..; Blank, K.; Rowan A.E. Stiffness versus architecture of single helical polyisocyanopeptides Chemical Science (2013), 4, 2357-2363. Schwartz, E.; Liegeois, V.; Koepf, M.; Bodis, P.; Cornelissen, J.J.L.M. ; Brocorens, P.; Beljonne, D.; Nolte, R.J.M. ; Rowan A. E.; Woutersen, S., Beta Sheets with a Twist: The Conformation of Helical Polyisocyanopeptides Determined by Using Vibrational Circular Dichroism. Chem. Eur J. (2013), 19, 13168-13174. Elemans, J.A.A.W. ; Nolte, R.J.M. ; Rowan, A.E. ; Edited By:Li, Alexander D. Q, Well-defined porphyrin architectures from self-assembly and dewetting, Molecular Self-Assembly (2013), 239-258. Rueben, P.; Kouwer, P.H.J. ; Rowan, A.E. ; Klumperman, B. Templated Hierarchical Self-Assembly of Poly(p-aryltriazole) Foldamers. Angew. Chem., Int. Ed., (2013) 52 (42), 11040-11044.
van Dongen, S.F.M. ; Clerx, J.; Norgaard, K.; Bloemberg, T.G. ; Cornelissen, J.J.L.M. ; Trakselis, M.A. ; Nelson, S.W. ; Benkovic, S.J. ; Rowan A.E. ; Nolte, R.J.M. A clamp-like biohybrid catalyst for DNA oxidation. Nature Chemistry, (2013) 5 (11), 945-951. *Mandal, S.; Eksteen-Akeroyd, Z. H.; Jacobs, M. J.; Hammink, R.; Koepf, M.; Lambeck, A.J.A. ; van Hest, J. C. M.; Wilson, C. J.; Blank, K.; Figdor, C. G.; Rowan, A. E. Therapeutic nanoworms: towards novel synthetic dendritic cells for immunotherapy Chem. Sci., (2013), 4, 4168-4174. M. de Torres, R. van Hameren, R. J. M. Nolte, A. E. Rowan, J. A. A. W. Elemans. Photocatalytic oxidation of stilbene by self-assembled stacks of manganese porphyrins Chem. Commun., 2013, 49, 10787-10789. F. F. B. J. Janssen, L. C. J. M. Peters , P. P. J. Schlebos , J. M. M. Smits , R. de Gelder , A. E. Rowan Uncorrelated Dynamical Processes in TetranuclearCarboxylate Clusters Studied by Variable-Temperature H NMR Spectroscopy. Inorg. Chem., (2013), 52 (22), 13004–13013. Gowda, C.M. ; van Eck, E.R. H.; van Buul, A.M.; Schwartz, E.; van Pruissen, G.W.P. ; Cornelissen, J.J.L.M. ; Rowan, A.E. ; Nolte, R.J.M. ; Kentgens, A.P.M. Direct Backbone Structure Determination of Polyisocyanodipeptide Using Solid-State Nuclear Magnetic Resonance, Macromolecules (2012), 45(5), 2209-2218.
van den Bruele, F. J.; de Poel, W.; Sturmans, H. W. M.; Pintea, S.; de Gelder, R.; Wermeille, D.; Juricek, M.; Rowan, A. E.; van Enckevort, W. J. P.; Vlieg, E. Monolayer and aggregate formation of a modified phthalocyanine on mica determined by a delicate balance of surface interactions, Surface Science (2012), 606, 830-835. Terentyeva, T.G. ; Engelkamp, H.; Rowan, A.E. ; Komatsuzaki, T.; Hofkens, J.; Li, C-B. ; Blank, Ke. Dynamic Disorder in Single-Enzyme Experiments: Facts and Artifacts ACS Nano (2012), 6(1), 346-354. Veling, N.; van Hameren, R.; van Buul, A.M.; Rowan, A.E. ; Nolte, R.J.M. ; Elemans, J.A.A.W. Solvent-dependent amplification of chirality in assemblies of porphyrin trimers based on benzene tricarboxamide Chem. Comm. (2012), 48, 4371-4373. Lim, E.; Gao, F.; Schwartz, E.; Cornelissen, J.J.L.M. ; Nolte, R.J.M. ; Rowan, A.E. ; Greenham, N.C.; Do, L-M. Carbazole functionalized isocyanide brushes in heterojunction photovoltaic devices. J. Nanosci. Nanotechnol. (2012), 12(1), 503-507.
de Loos, F.; de la Torre, G.; Torres, T.; Cornelissen, J.J.L.M. ; Rowan, A.E. ; Nolte, R.J.M. Construction of phthalocyanine-terminated polystyrene nanoarchitectures J. Phys. Org. Chem., (2012), 25(7), 586-591. Lopez-Duarte, I.; Martinez-Diaz, M.V. ; Schwartz, E.; Koepf, M.; Kouwer, P.H J.; Rowan, A.E. ; Nolte, R.J.M. ; Torres, T. Postfunctionalization of Helical Polyisocyanopeptides with Phthalocyanine Chromophores by "Click Chemistry", ChemPlusChem (2012), 77(8), 700-706. Juricek, M.; Kouwer, P.H.J. ; Rowan, A.E. Triazole: a unique building block for the construction of functional materials’ Chem. Comm. (2011), 47, 8740-8749. Juricek, M.; Felici, M.; Contreras-Carballada, P.; Lauko, J.; Bou, S.R. ; Kouwer, P.H.J. ; Brouwer, A.M.; Rowan, A.E. Triazole-pyridine ligands: a novel approach to chromophoric iridium arrays, J. Mat. Chem. (2011), 21, 2104–2111. Huang, Y-S.; Yang, X.; Schwartz, E.; Lu, L.P.; Albert-Seifried, S.; Finlayson, C.E. ; Koepf, M.; Kitto, H.J. ; Ulgut, B.; Otten, M.B.J. ; Nolte, R.J.M. ; Friend R.; Rowan A.E. Sequential Energy and Electron Transfer in Polyisocyanopeptide-Based Multichromophoric Arrays J. Phys. Chem. B (2011), 115(7), 1590-1600.
te Riet, J.; Katan, Allard J.; Rankl, C.; Stahl, S.W. ; van Buul, A.M.; Phang, I.Y. ; Gomez-Casado, A.; Schoen, P.; Gerritsen, J.W. ; Cambi, A.; Rowan, A.E. Interlaboratory round robin on cantilever calibration for AFM force spectroscopy, Ultramicroscopy (2011), 111, 1659-1669. Juricek, M.; Stout, K.; Kouwer, P.H. J.; Rowan, A.E. The trisubstituted-triazole approach to extended functional naphthalocyanines. J. Porphyrins Phthalocyanines (2011), 15, 898-907. Sukul, P.K. ; Asthana, D.; Mukhopadhyay, P.; Summa, D.; Muccioli, L.; Zannoni, C.; Beljonne, D.; Rowan, A.E. ; Malik, S. Assemblies of perylene diimide derivatives with melamine into luminescent hydrogels, Chem. Comm. (2011), 47(43), 11858–11860. Janssen, F.F.B.J. ; Veraart, L.P.J. ; Smits, J.M.M. ; de Gelder, R.; Rowan, A.E. Solvent, Linker, and Anion Effects on the Formation, Connectivity, and Topology of Cu(I)/PPh3/N-Donor Ligand Coordination Polymers, Cryst. Growth Des. (2011), 11(10), 4313-4325. Janssen, F.F.B.J. ; de Gelder, R.; Rowan, A.E. The Multiple Phenyl Embrace as a Synthon in Cu(I)/PPh3/N-Donor Ligand Coordination Polymers Cryst. Growth Des. (2011), 11(10), 4326-4333. Schwartz, E.; Koepf, M.; Kitto, H.J. ; Nolte, R.J. M.; Rowan, A.E. Helical poly(isocyanides): past, present and future Polym. Chem. (2011), 2(1), 33-47. Minten, I.J. ; Claessen, V.I. ; Blank, K.; Rowan, A.E. ; Nolte, R.J.M. ; Cornelissen, J.J.L.M. Catalytic capsids: the art of confinement Chem. Sci. (2011), 2, 358-362. Rowan, A.E. ; Elemans, J.A.A.W. ; Nolte, R.J. M. A toroidal oxidation catalyst. Ed. Sauvage, Jean-Pierre; Gaspard, Pierre. Non-Covalent Assemblies to Molecular Machines (2011), 225-230. Gowda, C.M. ; Vasconcelos, F.; Schwartz, E.; van Eck, E.R.H. ; Marsman, M.; Cornelissen, J.J.L.M. ; Rowan, A.E. ; de Wijs, G.A. ; Kentgens, A.P.M. Hydrogen bonding and chemical shift assignments in carbazole functionalized isocyanides from solid-state NMR and first-principles calculations. PCCP (2011), 13(28), 13082-13095. Juricek, M.; Stout, K.; Kouwer, P.H. J.; Rowan, A. E. Fusing Triazoles: Toward Extending Aromaticity Org. Lett. (2011), 13, 3494-3497.
van den Bruele, F.J.; Elemans, J.A.A.W. ; Rowan, A.E. ; van Enckevort, W.J.P. ; Vlieg, E. Self-Assembly of Porphyrins on a Single Crystalline Organic Substrate. Langmuir (2010) 498-503. Monnereau, C.; Hidalgo-Ramos, P.; Deutman, A.B.C. ; Elemans, J.A.A.W. ; Nolte, R.J.M. ; Rowan, A.E. Porphyrin Macrocyclic Catalysts for the Processive Oxidation of Polymer Substrates. J. Am. Chem. Soc. (2010), 132, 1529-1531. Schwartz, E.; Le Gac, S.; Cornelissen, J. J. L. M.; Nolte, R.J. M.; Rowan, A E. Macromolecular multi-chromophoric scaffolding. Chem. Soc. Rev. (2010), 39(5), 1576-1599. Zhang, J.; B., M. I.; Rowan, A. E.; Rasing, T. Compartmentalized Multistable Liquid Crystal Alignment. Adv. Mat. (2010), 22, 961–965. Palermo, V.; Schwartz, E.; Finlayson, C. E.; Liscio, A.; Otten, M.B. J.; Trapani, S.; Muellen, K.; Beljonne, D.; Friend, R.H.; Nolte, R. J. M.; Rowan, A. E.; Samori, P. Macromolecular Scaffolding: The Relationship Between Nanoscale Architecture and Function in Multichromophoric Arrays for Organic Electronics. Adv. Mat. (2010), 22, E81-E88. Le Gac, S.; Schwartz, E.; Koepf, M.; Cornelissen, J. J. L. M.; Rowan, A. E.; Nolte, R.J. M. Cysteine-Containing Polyisocyanides as Versatile Nanoplatforms for Chromophoric and Bioscaffolding. Chem. Eur. J. (2010), 16, 6176-6186. Schwartz, E.; Lim, E.; Gowda, C. M.; Liscio, A.; Fenwick, Oliver; T., G.; Palermo, Vincenzo; de Gelder, R.; Cornelissen, J. J. L. M.; Van Eck, E.R. H.; Kentgens, A. P. M.; C., F.; Nolte, R. J. M.; Samori, P.; Huck, W.T. S.; Rowan, A.E. Synthesis, Characterization, and Surface Initiated Polymerization of Carbazole Functionalized Isocyanides. Chem. Mat. (2010), 22, 2597-2607. Schwartz, E.; Domingos, S.R. ; Vdovin, A.; Koepf, M.; Buma, W. J.; Cornelissen, J.J.L.M. ; Rowan, A.E. ; Nolte, R.J.M. ; Woutersen, S. Direct Access to Polyisocyanide Screw Sense Using Vibrational Circular Dichroism Macromolecules (2010), 43(19), 7931-7935. Seifried, S.; Finlayson, C.E. ; Laquai, F.; Friend, R.H.; Swager, T.M. ; Kouwer, P.H.J. ; Juricek, M.; Kitto, H.J. ; Valster, S.; Nolte, R.J.M. ; Multichromophoric Phthalocyanine-(Perylenediimide) Molecules: a Photophysical Study Chem. Eur. J. (2010), 16, 10021-10029. De Hoog, H.-P.M.; Arends, I.W.C.E. ; Rowan, A.E. ; Cornelissen, J.J.L.M. ; Nolte, R.J.M. A hydrogel-based enzyme-loaded polymersome reactor Nanoscale (2010), 2(5), 709-716. Claessen, Victor I.; Engelkamp, Hans; Christianen, Peter C. M.; Maan, Jan C.; Nolte, Roeland J. M.; Blank, Kerstin; Rowan, Alan E. Single-biomolecule kinetics: the art of studying a single enzyme Annual Review of Analytical Chemistry (2010), 3, 319-340. Zhang, J; Hoogboom, J; Kouwer, PHJ; Rowan, AE; Rasing, T. Uniform N-(2-Aminoethyl)(3-aminopropyl)trimethoxysilane Monolayer Growth in Water, J.Phy.Chem. C, (2009), 112, 20105–20108. Juricek, M; Kouwer, P.H.J. ; Rehak, J; Sly, J; Rowan, A.E. A Novel Modular Approach to Triazole-Functionalized Phthalocyanines Using Click Chemistry. J. Org. Chem., (2008), 74, 21–25. Foster, S; Finlayson, C.E. ; Keivanidis, P.E. ; Huang, Y.S. ; Hwang, I; Friend, R.H.; Otten, M.B.J. ; Lu, L.P.; Schwartz, E; Nolte, R.J.M. ; Rowan, A.E. Improved Performance of Perylene-Based Photovoltaic Cells Using Polyisocyanopeptide Arrays. Macromolecules, (2009), 42 (6): 2023–2030. Schwartz, E; Palermo, V; Finlayson, CE; Huang, YS; Otten, MBK; Liscio, A; Trapani, S; Gonzalez-Valls, I; Brocorens, P; Cornelissen, JJLM; Peneva, K; Mullen, K; Spano, FC; Yartsev, A; Westenhoff, S; Friend, RH; Beljonne, D; Nolte, RJM; Samori, P; Rowan, AE. "Helter-Skelter-Like" Perylene Polyisocyanopeptides. Chemistry- Eur. J., (2009), 15 (11): 2536-2547.
van Hameren, R ; Elemans, JAAW; Wyrostek, D; Tasior, M; Gryko, DT; Rowan, AE; Nolte, RJM, Self-assembly of corrole trimers in solution and at the solid-liquid interface J. Mat. Chem., (2009), 19 (1): 66-69. Brede, J.; Linares, M.; Lensen, R.; Rowan, A. E.; Funk, M.; Broring, M.; Hoffmann, G.; Wiesendanger, R. Adsorption and conformation of porphyrins on metallic surfaces, J. Vac. Sci. Technol., B, (2009), 27(2), 799-804. Brede, J.; Linares, M.; Kuck, S.; Schwoebel, J.; Scarfato, A.; Chang, . ; Hoffmann, G.; Wiesendanger, R.; Lensen, R.; Kouwer, P. H. J.; Hoogboom, J.; Rowan, A. E.; Broering, M.; Funk, M.; Stafstroem, S.; Zerbetto, F.; Lazzaroni, R.. Dynamics of molecular self-ordering in tetraphenyl porphyrin monolayers on metallic substrates. Nanotechnology (2009), 20(27), 275602. Schwartz, E.; Koepf, M.; Kitto, H. J.; Espelt, M.; Nebot-Carda, Vicent J.; De Gelder, R.; Nolte, R.J. M.; Cornelissen, . J. L. M.; Rowan, A E. Water soluble azido polyisocyanopeptides as functional β -sheet mimics. J. Polym. Sci., A: Poly. Chem. (2009), 47(16), 4150-4164. Caiazzo, A.; Garcia, P. M. L.; Wever, R.; van Hest, J.C. M.; Rowan, A. E.; Reek, J. N. H. Synergy between chemo- and bio-catalysts in multi-step transformations. Org. & Bio. Chem. (2009), 7(14), 2926-2932. Dabirian, R.; Palermo, V.; Liscio, A.; Schwartz, E.; Otten, M. B. J.; Finlayson, C. E.; Treossi, E.; Friend, R. H.; Calestani, G.; Mullen, K.; Nolte, R.J. M.; Rowan, A. E.; Samori, P. The Relationship between Nanoscale Architecture and Charge Transport in Conjugated Nanocrystals Bridged by Multichromophoric Polymers. J. Am. Chem.Soc. (2009), 131(20), 7055-7063. Deutman, A. B.; Monnereau, C.; Moalin, M.; Coumans, R.G. E.; Veling, N.; Coenen, M.; Smits, Jan M. M.; de Gelder, R.; Elemans, J. A. A. W.; Ercolani, G.; Nolte, R.J. M.; Rowan, Alan E. Squaring cooperative binding circles. Proc. Natl. Acad. Sci. U.S.A. (2009), 106(26), 10471–10476. den Boer, D.; Coenen, M. J. J.; van der Maas, M.; Peters, T. P. J.; Shklyarevskii, O. I.; Elemans, J. A. A. W.; Rowan, A. E.; Speller, S. Electron transport through CO studied by gold break-junctions in nonpolar liquids. J. Phys. Chem. C (2009), 113(34), 15412-15416. Schwartz, E.; Bodis, P.; Koepf, M.; Cornelissen, J. J. L. M.; Rowan, A. E.; Woutersen, S.; Nolte, R. J. M. Self-trapped vibrational states in synthetic b -sheet helices. Chem. Comm. (2009), (31), 4675-4677.
de Hoog, H. M.; Nallani, M.; Cornelissen, J. J. L. M.; Rowan, A. E.; Nolte, R. J. M.; Arends, I. W. C. E. Biocatalytic oxidation by chloroperoxidase from Caldariomyces fumago in polymersome nanoreactors. Org. & Bio.Chem. (2009), 7(22), 4604-4610. Bodis, Pavol; Schwartz, Erik; Koepf, Matthieu; Cornelissen, Jeroen J. L. M.; Rowan, Alan E.; Nolte, Roeland J. M.; Woutersen, Sander. Vibrational self-trapping in beta-sheet structures observed with femtosecond nonlinear infrared spectroscopy. J. Chem. Phys. (2009), 131(12),124503/1-124503/6. Kampert, E.; Janssen, F.; Boukhvalov, D.; Russcher,J. ; Smits,J. ; de Gelder, R.; De Bruin, B.; Christianen, P.; Zeitler, U.;Katsnelson,M. ; Maan, J.; Rowan, A. Ligand-Controlled Magnetic Interactions in Mn4 Clusters. Inorganic Chem. (2009) 48(24), 11903-11908. Palermo, Vincenzo; Schwartz, Erik; Liscio, Andrea; Otten, Matthijs B. J.; Muellen, Klaus; Nolte, Roeland J. M.; Rowan, Alan E.; Samori, Paolo. Influence of p -p stacking on the self-assembly and coiling of multi-chromophoric polymers based on perylenebis(dicarboximides): an AFM study. Soft Matter, (2009), 5(23), 4680-4686.
van Hameren, Richard; van Buul, Arend M.; Castriciano, Maria A.; Villari, Valentina; Micali, Norberto; Schoen, Peter; Speller, Sylvia; Scolaro, Luigi Monsu; Rowan, Alan E.; Elemans, Johannes A. A. W.; Nolte, Roeland J. M. Supramolecular Porphyrin Polymers in Solution and at the Solid-Liquid Interface. Nano Letters (2008), 8(1), 253-259. Lim, Eunhee; Tu, Guoli; Schwartz, Erik; Cornelissen, Jeroen J. L. M.; Rowan, Alan E.; Nolte, Roeland J. M.; Huck, Wilhelm T. S. Synthesis and Characterization of Surface-Initiated Helical Polyisocyanopeptide Brushes. Macromolecules (2008), 41(6), 1945-1951. Kentgens, A.P.M. ; van Eck, E.R.H. ; Gowda, C.; Nolte, R.J.M. ; Cornelissen, J.J.L.M. ; Rowan, A.E. Magic angle spinning and micro-MAS NMR spectroscopy of biomimetic polymers. Polymer Preprints (2008), 49, 693-694. Carette, N.; Engelkamp, H.; Akpa, E.; Pierre, S.J. ; Cameron, N.R. ; Christianen, P.C.M. ; Maan, J.C.; Thies, J.C.; Weberskirch, R.; Rowan, A.E. ; Nolte, R.J. M.; Michon, T.; Van Hest, J.C.M. A virus-based biocatalyst, Nature Nanotech. (2008), 2(4), 226-229. Valle, F.; Zuccheri, G.; Bergia, A.; Ayres, L.; Rowan, A.E. ; Nolte, R.J.M. ; Samori, B. A polymeric molecular "handle" for multiple AFM-based single-molecule force measurements. Angew. Chem. Int. Ed. (2008), 47(13), 2431-2434.
de Hoog, H.-P.M.; Vriezema, D.M. ; Nallani, M.; Kuiper, S.; Cornelissen, J.J.L.M. ; Rowan, A.E. ; Nolte, R.J.M. Tuning the properties of PS-PIAT block copolymers and their assembly into polymersomes. Soft Matter (2008), 4(5), 1003-1010. Elemans, J.A. A. W.; Cornelissen, J.J.L. M.; Feiters, M.C. ; Rowan, A.E. ; Nolte, R.J.M. Bio-inspired supramolecular catalysis. Supramolecular Catalysis (2008), 143-164. Veling, N.; Thomassen, P.J. ; Thordarson, P.; Elemans, J.A.A.W. ; Nolte, R.J.M. ; Rowan, A.E. Construction of supramolecular multi-component assemblies by using allosteric interactions. Tetrahedron (2008), 64(36), 8535-8542. Palermo, V.; Otten, M.B.J. ; Liscio, A; Schwartz, E.; de Witte, P.A.J. ; Castriciano, M.A. ; Wienk, M.M. ; Nolde, F.; De Luca, G.; Cornelissen, J.J.L.M. ; Janssen, R.A.J. ; Mullen, K.; Rowan, A.E. ; Nolte, R.J.M. ; Samori, P. The Relationship between Nanoscale Architecture and Function in Photovoltaic Multichromophoric Arrays as Visualized by Kelvin Probe Force Microscopy. J. Am. Chem. Soc. (2008), 130, 14605-14614.
van Hameren, R; van Buul, A.M.; Castriciano, M.A. ; Villari, V; Micali, N; Schon, P; Speller, S; Scolaro, L.M. ; Rowan, A.E. ; Elemans, J.A.A.W. ; Nolte, R.J.M. Supramolecular porphyrin polymers in solution and at the solid-liquid interface’ Nano Letters, (2008), 8 (1): 253-259. Kitto, H.J. ; Schwartz, E.; Nijemeisland, M.; Koepf, M.; Cornelissen, J.J.L.M. ; Rowan, A.E. ; Nolte, R.J.M. Post-modification of helical dipeptido polyisocyanides using the 'click' reaction J. Mat. Chem., (2008), 18 (46): 5615-5624. Deutman, A.B.C. ; Monnereau, C.; Elemans, J.A.A.W. ; Ercolani, G.; Nolte, R.J.M. ; Rowan, A.E., Mechanism of Threading a Polymer Through a Macrocyclic Ring, Science, (2008), 322 (5908): 1668-1671. Kuiper, S.M. ; Nallani, M.; Vriezema, D.M. ; Cornelissen, J.J.L.M. ; van Hest, J.C.M. ; Nolte, R.J.M. ; Rowan, A.E., Enzymes containing porous polymersomes as nano reaction vessels for cascade reactions, Org. & Bio. Chem., (2008), 6, 4315-4318. Finlayson, C.E. ; Friend, R.H.; Otten, M.B.J. ; Schwartz, E.; Cornelissen, J.J.L.M. ; Nolte, R.J.M; Rowan, A.E; Samori, P.; Palermo, V.; Liscio, A.; Peneva, K; Mullen, K.; Trapani, S.; Beljonne, D. Electronic Transport Properties or Ensembles of Perylene-Substituted Poly-isocyanopeptide Arrays, Adv. Func. Mat, (2008), 18, 3947-3955. Metselaar, G.A. ; Adams, P. J. H. M.; Nolte, R. J. M.; Cornelissen, J. J. L. M.; Rowan, A. E.. Polyisocyanides derived from tripeptides of alanine. Chem. Eur. J. (2007), 13(3), 950-960. Elemans, J. A. A. W.; Bijsterveld, E. J. A.; Rowan, A. E.; Nolte, Ro.J. M. Manganese porphyrin hosts as epoxidation catalysts - activity and stability control by axial ligand effects. Eur.J. Org. Chem. (2007), (5), 751-757. Dirks, A. J.; Cornelissen, Jeroen J. L. M.; van Delft, Floris L.; van Hest, Jan C. M.; Nolte, Roeland J. M.; Rowan, Alan E.; Rutjes, Floris P. J. T. From (bio)molecules to biohybrid materials with the click chemistry approach. QSAR & Combinatorial Science, (2007), 26(11-12), 1200-1210. Flomenbom, O.; Hofkens, J.; Velonia, K.; de Schryver, F. C.; Rowan, A. E.; Nolte, R. J. M.; Klafter, J; Silbey, R. J. Correctly validating results from single molecule data: the case of stretched exponential decay in the catalytic activity of single lipase B molecules. Chem. Phys. Lett. (2006), 432, 371–374. Metselaar, G.A. ; Wezenberg, S. J.; Cornelissen, J. J. L. M.; Nolte, R.J. M.; Rowan, A. E. Lyotropic liquid-crystalline behavior of polyisocyanodipeptides. J. of Poly. Sci., Part A: Poly.Chem. (2007), 45(6), 981-988. Hidalgo Ramos, P.; Coumans, R. G. E.; Deutman, A. B. C.; Smits, J.M. M.; De Gelder, R.; Elemans, J. A. A. W.; Nolte, Roeland J. M.; Rowan, A. E. Processive Rotaxane Systems. Studies on the Mechanism and Control of the Threading Process. J. Am.Chem. Soc. (2007), 129(17), 5699-5702. Schwartz, E.; Kitto, H.J. ; de Gelder, R.; Nolte, R.J.M. ; Rowan, A.E. ; Cornelissen, J.J.L.M. Synthesis, characterisation and chiroptical properties of click'able polyisocyanopeptides. J. Mat. Chem. (2007), 17(19), 1876-1884. Hoogboom, J.; Elemans, J.A. A. W.; Rowan, A.E. ; Rasing, T. H. M.; Nolte, R. J. M. The development of self-assembled liquid crystal display alignment layers. Phil. Trans. R. Soc. A (2007), 365, 1553-1576. Hulsken, B.; Van Hameren, R.; Gerritsen, J. W.; Khoury, T.; Thordarson, Pall; Crossley, M. J.; Rowan, Alan E.; Nolte, R.J. M.; Elemans, J. A. A. W.; Speller, S. Real-time single-molecule imaging of oxidation catalysis at a liquid-solid interface. Nature Nanotechnology (2007), 2(5), 285-289. Hoogboom, J.; Juricek, M.; Lauko, J.; Rehak, J.; Woltinge, T.; van de Rult, K.; Flipse, K. F. J.; Rowan, A. E. Click chemistry approach to graphitic structures. PMSE Preprints (2007), 97, 110-111. Elemans, J.A.A.W. ; Coumans, R.G.E. ; Hidalgo-Ramos, P.; Deutman, A.B.C. ; Rowan, A.E. ; Nolte, R.J.M. Mechanistic aspects of the threading of polymers in processive rotaxane catalysts. PMSE Preprints (2007), 97, 933-934. Metselaar, G.A. ; Schwartz, E.; de Gelder, R.; Feiters, M.C. ; Nikitenko, S.; Smolentsev, G.; Yalovega, G.E. ; Soldatov, A.V. ; Cornelissen, J.J.L.M. ; Rowan, A.E. ; Nolte, R.J. M. X-ray spectroscopic and diffraction study of the structure of the active species in the NiII-catalyzed polymerization of isocyanides. ChemPhysChem (2007), 8(12), 1850-1856. Hoogboom, Johan; Elemans, Johannes A. A. W.; Rasing, Theo; Rowan, Alan E.; Nolte, Roeland J. M. Supramolecular command surfaces for liquid crystal alignment. Polymer International (2007), 56(10), 1186-1191. Comellas-Aragones, M.; Engelkamp, H.; Claessen, V.I. ; Sommerdijk, N.A.J.M. ; Rowan, A.E. ; Christianen, P.C.M. ; Maan, J.C.; Verduin, B.J.M. ; Cornelissen, J.J.L.M. ; Nolte, R.J.M. A virus-based single-enzyme nanoreactor. Nature Nanotech. (2007), 2(10), 635-639. Lensen, M.C. ; Elemans, J.A.A.W. ; van Dingenen, S.J. T.; Gerritsen, J.W. ; Speller, S.; Rowan, A.E. ; Nolte, R.J. M. Giant porphyrin disks: control of their self-assembly at liquid-solid interfaces through metal-ligand interactions. Chem. Eur. J. (2007), 13(28), 7948-7956. Vriezema, D.M. ; Garcia, P.M. L.; Oltra, N.S. ; Hatzakis, N.S. ; Kuiper, S.M. ; Nolte, R.J. M.; Rowan, A.E. ; van Hest, J.C. M. Positional assembly of enzymes in polymersome nanoreactors for cascade reactions. Angew. Chemie, Int. Ed. (2007), 46(39), 7378-7382. Hoogboom, J.; Velonia, K.; Rasing, T.; Rowan, A. E.; Nolte, R. J. M. LCD-based detection of enzymatic action. Chem.Comm. (2006), (4), 434-435. Thomassen, P.J. ; Foekema, J.; Jordana i Lluch, R.; Thordarson, P.; Elemans, J. A. A. W.; Nolte, R.J. M.; Rowan, A. E. Self-assembly studies of allosteric photosynthetic antenna model systems. N.J.Chem. (2006), 30(2), 148-155. Velonia, K.; Cornelissen, J. J. L. M.; Feiters, M. C.; Rowan, A. E.; Nolte, R. J. M. Aggregation of amphiphiles as a tool to create novel functional nano-objects. Nanoscale Assembly (2006), 119-185. Engelkamp, H.; Hatzakis, N. S.; Hofkens, J.; De Schryver, F. C.; Nolte, R.J. M.; Rowan, A. E. Do enzymes sleep and work? Chem. Comm. (2006), (9), 935-940. N. S. Hatzakis, H. Engelkamp, K. Velonia, J. Hofkens, P. C. M. Christianen, A. Svendsen, S.A. Patkar, J.Vind, J. C. Maan, A. E. Rowan, R. J. M. Nolte, “Synthesis and single enzyme activity of a clicked lipase–BSA hetero-dimer” Chem. Comm. (2006), (19), 2012-2014. Wezenberg, S.J. ; Metselaar, G.A. ; Rowan, A.E. ; Cornelissen, J.J. L. M.; Seebach, D.; Nolte, R.J.M. Synthesis, characterization, and folding behavior of gamma -amino acid derived polyisocyanides. Chem. Eur. J. (2006), 12(10), 2778-2786. Hoogboom, J.; Rasing, T.; Rowan, A. E.; Nolte, R J. M. LCD alignment layers. Controlling nematic domain properties. J. Mat. Chem. (2006), 16(14), 1305-1314. De Witte, P.A. J.; Hernando, J.; Neuteboom, E.E. ; Van Dijk, E.M. H. P.; Meskers, S.C. J.; Janssen, R. A. J.; Van Hulst, N. F.; Nolte, R. J. M.; Garcia-Parajo, M. F.; Rowan, A.E.. Synthesis and Characterization of Long Perylenediimide Polymer Fibers: From Bulk to the Single-Molecule Level. J. Phys. Chem. B, (2006), 110(15), 7803-7812. Samori, P.; Cacialli, H.; Anderson, L.; Rowan, A. E.; Special Issue on Supramolecular Approaches to Organic Electronics and Nanotechnology. Adv. Mater. (2006), 18. Elemans, J.A.A.W. ; van Hameren, R.; Nolte, R.J. M.; Rowan, A.E. Molecular materials by self-assembly of porphyrins, phthalocyanines, and perylenes. Adv. Mat. (2006), 18, 1251-1266. Hetterscheid, D.G. H.; Hendriksen, C.; Dzik, W. I.; Smits, Jan M. M.; Van Eck, E.R. H.; Rowan, A. E.; Busico, V.; Vacatello, M.; Van Axel Castelli, V.; Segre, A.; Jellema, E.; Bloemberg, T. G.; De Bruin, B. Rhodium-Mediated Stereoselective Polymerization of "Carbenes". J. Am. Chem. Soc. (2006), 128, 9746-9752. Hulsken, B.; van Hameren, R.; Thordarson, P.; Gerritsen, J.W. ; Nolte, R.J. M.; Rowan, A.E. ; Crossley, M. J.; Elemans, J A. A. W.; Speller, S. Scanning tunneling microscopy and spectroscopy studies or porphyrins at solid-liquid interfaces. Jap. J.of App. Phy., Part 1: (2006), 45(3B), 1953-1955. Samori, P.; Cacialli, F.; Anderson, Harry L.; Rowan, A.E. Towards complex functions from complex materials. Adv. Mater. (2006), 18, 1235-1238. Elemans, J.A.A.W. ; van Hameren, R.; Nolte, R.J. M.; Rowan, A.E. Molecular Materials by Self-Assembly of Porphyrins, Phthalocyanines, and Perylenes. Adv. Mater., (2006), 18, 1251-1266. Hetterscheid, D.G.H. ; Hendriksen, C.; Dzik, W.I. ; Smits, J.M.M. ; Van Eck, E.R.H. ; Rowan, A.E. ; Busico, V.; Vacatello, M.; Van Axel Castelli, V.; Segre, A.; Jellema, E.; Bloemberg, T.G. ; De Bruin, B. Rhodium-Mediated Stereoselective Polymerization of Carbenes. J. Am. Chem. Soc. (2006), 128, 9746-9752. Clerx, J.; Spiering, M.M. ; Zhuang, Z.; Benkovic, S.J. ; Cornelissen, J.J.L.M. ; Rowan, A.E. ; Nolte, R.J. M. Artificial processive enzymes based on the T4 replisome. Polymer Preprints (2006), 47(2), 207-208. Lambermon, M. H. L.; Hendriks, L. J. A.; Schoffelen, S.; Vos, M. R. J.; Hatzakis, N. S.; Carette, N.; Rowan, A. E.; Cornelissen, J. L. M.; Michon, T.; Sommerdijk, N. A. J. M.; von Hest, J. C. M. Assembly strategies for enzyme immobilization. Polymer Preprints (2006), 47(2), 209-210.
van Hest, J.C. M.; Vriezema, D.M. ; Garcia, P.M. L.; Cornelissen, J.J. L. M.; Rowan, A.E. ; Nolte, R.J. M. Enzyme positional assembly in polymeric capsules. Polymer Preprints (2006), 47(2), 238-239. Brennan, J.L. ; Hatzakis, N. S.; Tshikhudo, T. R.; Dirvianskyte, N.; Razumas, V.; Patkar, S.; Vind, J.; Svendsen, A.; Nolte, R. J. M.; Rowan, A. E.; Brust, M.. Bionanoconjugation via Click Chemistry: The Creation of Functional Hybrids of Lipases and Gold Nanoparticles. Biocon. Chem. (2006), 17(6), 1373-1375. Flomenbom, O.; Hofkens, J.; Velonia, K.; de Schryver, F.C. ; Rowan, A. E.; Nolte, R.J. M.; Klafter, J.; Silbey, R.J. Correctly validating results from single molecule data: The case of stretched exponential decay in the catalytic activity of single lipase B molecules. Chem. Phys. Letts (2006), 432(1-3), 371-374.
van Hameren, R.; Schoen, P.; van Buul, A.M.; Hoogboom, J.; Lazarenko, S.V. ; Gerritsen, J.W. ; Engelkamp, H.; Christianen, P.C.M. ; Heus, H.A. ; Maan, J.C.; Rasing, T.; Speller, S.; Rowan, A.E. ; Elemans, J.A.A.W. ; Nolte, R.J.M. Macroscopic Hierarchical Surface Patterning of Porphyrin Trimers via Self-Assembly and Dewetting. Science (2006), 314, 1433-1436. Coumans, R.G. E.; Elemans, J. A. A. W.; Nolte, R.J. M.; Rowan, A. E. Processive enzyme mimic: kinetics and thermodynamics of the threading and sliding process. Proc. of Nat.Acad.of Sci. USA (2006), 103(52), 19647-19651. W.Zhuang, C. Ecker, G. A. Metselaar, A. E. Rowan, R. J. M. Nolte, P. Samori, J. P. Rabe, ‘SFM characterization of hydrophobic single polymer chains in controlled environments: effect of tip adhesion and of chain swelling’, Macromolecules (2005), 38(2), 473-480. F.de Loos, I.C. Reynhout, J.J. L. M. Cornelissen, A. E. Rowan and R. J. M. Nolte ‘Construction of Functional Porphyrin Polystyrene Nano-Architectures by ATRP’, Chem.Comm, (2005), (1), 60-62. Cornelissen, J. J. L. M.; Dirks, A. J.; Reynhout, I. C.; Opsteen, J.; Hatzakis, N.; Sly, J.; Rowan, A. E.; van Hest, Jan C. M.; J. C. M.; Nolte, R. J. M. Funtional nano-sized assemblies from amphiphilic biohybrid macromolecules. Poly. Pre. (2005), 46(1), 41-42. Flomenbom, O.; Velonia, K.; Loos, D.; Masuo, S.; Cotlet, M.; Engelborghs, Yves; Hofkens, J.; Rowan, A. E.; Nolte, R. J. M.; Van der Auweraer, M.; De Schryver, F. C.; Klafter, J.. Stretched exponential decay and correlations in the catalytic activity of fluctuating single lipase molecules. Proc. Nat. Acad. Sci. USA (2005), 102(7), 2368-2372. Sly, J.; Kasak, P.; Gomar-Nadal, E.; Rovira, C.; Gorriz, L.; Thordarson, Pall; Amabilino, D. B.; Rowan, A. E.; Nolte, R. J. M. Chiral molecular tapes from novel tetra(thiafulvalene-crown-ether)-substituted phthalocyanine building blocks. Chem. Comm. (2005), (10), 1255-1257. Vriezema, D. M.; Aragones, M. Comellas; Elemans, J. A. A. W.; Cornelissen, J. J. L. M.; Rowan, A. E.; Nolte, R. J. M. Self-Assembled Nanoreactors. Chem. Rev., (2005), 1898-1934. Velonia, K.; Flomenbom, O.; Loos, D.; Masuo, S.; Cotlet, M.; Engelborghs, Y.; Hofkens, J.; Rowan, A. E.; Klafter, J.; Nolte, R. J. M.; de Schryver, F. C. Single-enzyme kinetics of CALB-catalyzed hydrolysis. Angew. Chemie, Int. Ed. (2005), 44(4), 560-564. Metselaar, G.A. ; Cornelissen, J.J.L.M. ; Rowan, A.E. ; Nolte, R.J.M., Acid- Initiated stereospecific polymerization of Isocyanopeptides. Angew. Chemie, Int. Ed. (2005), 44(4), 1990-1993. Cornelissen, J. J. L. M.; Dirks, A. J.; Opsteen, J. A.; Reynhout, I. C.; Hatzakis, N.; Sly, J.; Rowan, A. E.; Van Hest, J. C. M.; Nolte, R. J. M. Functional nano-sized assemblies from amphiphilic biohybrid macromolecules. Poly. Prepr, (2005), 46(1), 41-42. Samori, P.; Engelkamp, H.; de Witte, P.A.J. ; Rowan, A.E. ; Nolte, R.J.M. ; Rabe, J.P. Self-organization of semiconducting polysiloxane-phthalocyanine on a graphite surface. Adv. Mater., (2005), 17(10), 1265-1268. Farrera, J.-A. ; Hidalgo-Ramos, P.; Hannink, J.M. ; Huskens, J.; Rowan, A. E.; Sommerdijk, N. A. J. M.; Nolte, R. J. M. Divalent ligand for intramolecular complex formation to streptavidin. Organic & Biomolecular Chemistry (2005), 3(13), 2393-2395.
van Gerven, P. C. M.; Elemans, J.A. 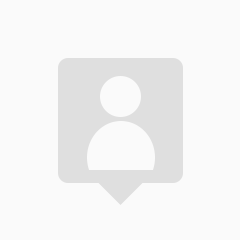 A. W.; Gerritsen, J. W.; Speller, Sylvia; Nolte, R. J. M.; R., Alan E.. Dynamic combinatorial olefin metathesis: templated synthesis of porphyrin boxes. Chem. Comm. (2005), (28), 3535-3537. Hoogboom, J.; Garcia, P. M. L.; Otten, M. B. J.; Elemans, J. A. A. W.; Sly, J.; Lazarenko, S. V.; Rasing, T.; Rowan, A. E.; Nolte, R.J.M. Tunable Command Layers for Liquid Crystal Alignment. J. Am Chem. Soc. (2005), 127(31), 11047-11052. Dirks, A. J.; Van Berkel, S.S.; Hatzakis, N. S.; Opsteen, J. A.; Van Delft, F. L.; Cornelissen, J. J. L. M.; Rowan, A. E.; Van Hest, J. C. M.; Rutjes, F. P. J. T.; Nolte, R. J. M. Preparation of biohybrid amphiphiles via the copper catalyzed Huisgen [3+2] dipolar cycloaddition reaction. Chem. Comm. (2005), (33), 4172-4174. Elemans, J.A.A.W. ; Slagt, V.F. ; Rowan, A. E.; Nolte, R.J.M. Templated self-assembly of porphyrin cages. Israel J. Chem. (2005), 45(3), 271-279. J. Hernando, P.A.J. Witte, E.M.H.P. van Dijk, J. Korterik, R.J.M. Nolte, N.F. van Hulst, A.E. Rowan, M.F. Garcia-Parajo, ‘Investigation of Perylene Nanowires by Single Molecule Fluorescence and Atomic Force Microscopy’, Angew. Chemie, (2004), 43, 4045-4049. P. Thordarson, R. G. E. Coumans, J. A. A. W. Elemans, R. J. M. Nolte and A. E. Rowan,‘ Allosterically Driven Self-Assembly’, Angew. Chemie. (2004), 43(36), 4755-4759. Samori, Paolo; Cacialli, Franco; Anderson, Harry L.; Rowan, Alan E. Preface. Synthetic Metals (2004), 147, 1-3. M.J.B. Otten, C. Ecker, G.A. Metselaar, A.E. Rowan, R.J.M. Nolte, P.Samori, J.P.Rabe,’ Alignment of Extremely Long Single Polymer Chains by Exploiting Hydrodynamic Flow, ChemPhysChem, 2004, 4, 1-6. Biohyrbrid giant amphiphiles by metal-to-ligand coordination. Velonia, K.; Thordarson, P.; Schubert, U.S.; Rowan, A. E.; Nolte, R. J.M. Polymer Preprints (2004), 45(1), 401-402. Supramolecular LCDs: hierarchical alignment of polysiloxanes. Hoogboom, J.; Garcia, P. M. L.; Rowan, A. E.; Rasing, T.; Nolte, R.J.M. Polymer Preprints (2004), 45(1), 905-906. Vriezema, D.M. ; Kros, A.; Hoogboom, J.; Rowan, A. E.; Nolte, R. J. M. Functional aggregates by self-assembly of thiophene-containing diblock copolymers. Polymer Preprints (2004), 45(1), 749-750. M.C. Lensen, S. J.T van Dingenen, J.A.A.W. Elemans, H. P. Dijkstra, G.P.M. van Klink, G. van Koten, J. W. Gerritsen, S. Speller, R.J.M. Nolte and A.E. Rowan, ‘Synthesis and self-assembly of giant porphyrin discs’ Chem. Comm., 2004 (7), 762-763. M.C. Lensen, K.Takazawa, J.A.A.W. Elemans, C.R.L.P.N. Jeukens, P.C.M. Christianen, J. C. Maan, A. E. Rowan, R. J.M. Nolte, ‘Aided Self-Assembly of Porphyrin Nanoaggregates into Ring-Shaped Architectures’, Chem. Eur. J., 2004, 10(4), 831-839. Thordarson, P.; Nolte, R.J. M.; Rowan, A.E. ‘Mimicking the Motion of Life: Catalytically Active Rotaxanes as Processive Enzyme Mimics’ Aus. J. Chem. (2004), 57(4), 323-327. Vriezema, D. M.; Kros, A.; De Gelder, R.; Cornelissen, J. J. L. M.; Rowan, A. E.; Nolte, R.J. M. Electroformed Giant Vesicles from Thiophene-Containing Rod-Coil Diblock Copolymers. Macromolecules (2004), 37(12), 4736-4739. Jeukens, C.R. L. P. N.; Lensen, M.C. ; Wijnen, F. J. P.; Elemans, J. A. A. W.; Christianen, Peter C. M.; Rowan, A. E.; Gerritsen, J. W.; Nolte, R. J. M.; Maan, J. C. Polarized Absorption and Emission of Ordered Self-Assembled Porphyrin Rings. Nano Lett. (2004), 4(8), 1401-1406. J.N.H. Reek, J.A.A.W. Elemans, R. de Gelder, P.T. Beurskens, A.E. Rowan, R.J.M. Nolte ‘ Self-association and self-assembly of molecular clips in solution and in the solid state’ Tehtrahedron 2003, 59(2), 175-185. M.C. Lensen, M. Castriciano, R.G.E. Coumans, J. Foekema, A. E. Rowan, L. Monsù Scolaro and R.J.M. Nolte Hexakis (pyridyl functionalised porphyrinato)benzene as a building block for the construction of multi chromophoric arrays Tetrahedron Lett. 2003, 43(51), 9351-9355. P. Thordarson, E.J.A. Bijsterveld, J.A.A.W. Elemans,P. Kasák, R.J.M. Nolte and A.E.Rowan, ‘Highly Negative Homotropic Allosteric Binding of Viologens to a Double-Cavity Porphyrin’, J. Am. Chem. Soc., 2003, 125, 1186-1187. R. G. E. Coumans, J. A. A. W. Elemans, P. Thordarson, R. J. M. Nolte and A E. Rowan Synthesis of novel porphyrin-containing rotaxanes via olefin metathesis Angew. Chem. Int. Ed. Engl. 2003 42(6), 650-654. P.C. Bell, M. Bergsma, I.P. Dolbnya, W.Bras, M.C.Stuart, A.E. Rowan, M.C. Feiters, J.B.F.N. Engberts Transfection mediated by Gemini surfactants: engineered escape from the endosomal compartment’, J. Am. Chem. Soc., 2003, 125(6), 1551-1558. D.M. Vriezema, J.Hoogboom, K. Velonia, K. Takazawa, P.C.M. Christianen, J.C. Maan, A.E. Rowan, R.J.M. Nolte Vesicles and polymerized vesicles from thiophene containing rod-coil block copolymers’ Angew. Chem. Int. Ed. Engl. 2003, 42(7), 702. K. Velonia, P. Thordarson, P. R. Andres, U.S. Schubert, A.E. Rowan, R. J. M. Nolte, ‘Polymer-Protein Giant Amphiphiles by Metal-to-Ligand Coordination’ Poly. Prepr. A.C.S. 2003, 44, 648. J.A.A.W. Elemans, R. J. M. Nolte, A. E. Rowan, ‘Hierarchical Self-assembly of a Host-Guest Porphyrin Array’, J. Porphyrins. Phthalocyanines 2003, 7: 249-255. P. Thordarson, R.Coumans, J.A.A.W. Elemans, R. J. M. Nolte and A.E. Rowan, ‘ Catalytic Rotaxanes; Mimicking Nature’s Processive Catalysts’, Poly. Prepr. A.C.S. 2003, 44, 604-605. J. Hoogboom, M. Behdani, J. A. A. W. Elemans, M. A. C. Devillers, R. de Gelder, A. E. Rowan, T. Rasing, R. J. M. Nolte, ‘Non-contact liquid crystal alignment by supramolecular amplification of nano-grooves’, Angew. Chem. Int. Ed., 2003, 42, 1812-1815. J.J.L.M. Cornelissen, W.S. Graswinckel, A.E. Rowan, N.A.J.M. Sommerdijk, R.J.M. Nolte, ‘Conformational Analysis of Dipetide-Derived Poyisocyanides’, J. Pol Sci. A, 2003, 41, 1725-1736. L. Brunsveld, E.W. Meijer, A.E. Rowan and R.J.M. Nolte, Chiral discotic molecules: expression and amplification of chirality, Materials-Chirality: Vol. 24 of Topics in Stereochemistry, ed. M.M. Green, R.J.M. Nolte, E.W. Meijer (2003) 373. J.A.A.W. Elemans, A. E. Rowan, R. J. M. Nolte ‘Mastering molecular matter. Supramolecular architectures by hierarchical self-assembly’, J. Mater. Chem. 2003, 13,1978. P.A.J. de Witte, M.Castriciano, J.J.L.M. Cornelissen, L.M. Scolaro, R.J.M. Nolte, A.E. Rowan, ‘Helical polymer-anchored porphyrin nanorods’, Chem. Eur. J., 2003, 9(8), 1775-1781. P. Thordarson, E. J. A. Bijsterveld, A. E. Rowan and, R.J.M. Nolte, ‘Epoxidation of Polybutadiene by a Topologically-Linked Catalyst’, Nature, 2003, 404, 915-918. J.A.A.W. Elemans, M. C. Lensen, J. W. Gerritsen, S.J.T. van Dingenen, J.W. Gerritsen, H. van Kempen, R. J. M. Nolte, A. E. Rowan, S. Speller, ‘ Scanning probe studies of nanosized porphyrin wheels at the solid-liquid interface’, AIP Conference Proceedings 697 (2003) 508. A.de la Escosura, MV. Martínez-Díaz, P. Thordarson, A.E. Rowan, R.J.M. Nolte and T. Torres, ‘Donor-Acceptor Phthalocyanine Nanoaggregates’, J. Am. Chem. Soc., 2003, 125, 40, 12300-12308. J.A.A.W. Elemans, M. C. Lensen, J. W. Gerritsen, S. Speller, H. van Kempen, R. J. M. Nolte, A. E. Rowan, ‘ Scanning probe studies of porphyrin assemblies and their supramolecular manipulation at a solid-liquid interface’, Adv. Mater., 15 (24): 2070, 2003. J.A.A.W. Elemans, R.R.J. Slangen, A.E. Rowan, R.J.M. Nolte, ‘Synthesis and Hierarchical Self-assembly of Cavity-containing Facial Amphiphiles’, J. Org. Chem., 9040-9049 2003. Elemans, Johannes A. A. W.; Rowan, Alan E.; Nolte, Roeland J. M. Hierarchical Self-Assembly of Amphiphilic Metallohosts To Give Discrete Nanostructures. J.Am.Chem.Soc., 2002 124 (7) 1532-1540. Velonia-K; Rowan A. E; Nolte-RJM, Lipase polystyrene giant amphiphiles, J.Am.Chem.Soc., 2002, 4224-4225. Samori, P.; Ecker, C.; Gossl, I.; de Witte, P. A. J.; Cornelissen, J. J. J. M.; Metselaar, Rowan, A. E.; Nolte, R. J. M.; Rabe, J. P. ‘High Shape Pesistence in single polymer chains rigidified with lateral hydrogen bonding networks’, Macromolecules, 2002, 35 (13), 5290-5294. Elemans, J.A.A.W. Elemans, Boerakker, M.J.; Holder, Holder, S.J. Rowan A.E., Cho. W.D. Percec, V.; Nolte, R.J.M., ‘Plastic- and Liquid-crystalline architectures from Dendritic Receptor Molecules’ Pro. Natl. Am. Soc. 2002, 99 (8), 5093-5098. J.A.A.W. Elemans, A. E. Rowan, R. J. M. Nolte, ‘Synthesis and physical properties of a porphyrin cavity based on glycoluril’, J. Supramol. Chem. 2002, 23, 345. S.J.Holder, J.A.A.W. Elemans, J.J.J.M. Donners, M.J.Boerakker, R.De Gelder, J.Barbera, A.E.Rowan, R.J.M.Nolte, ‘Lamellar Organic thin Films through Self-Assembly and Molecular Recognition’ J. Org. Chem. 2001, 66(2), 391-399. Escuder, B.; Rowan, A. E.; Feiters, M. C.; Nolte, R. J. M. Aggregation behavior and binding properties of an L-lysine appended glycoluril receptor. Tetrahedron Lett. 2001, 42(14), 2751-2753. Jansen, R. J.; de Gelder, R.; Rowan, A. E.; Scheeren, H. W.; Nolte, R. J. M. Molecular Clips Based on Propanediurea. Exceptionally High Binding Affinities for Resorcinol Guests. J. Org. Chem. 2001, 66(8), 2643-2653. Foekema, J.; Schenning, A.P.H.J. ; Vriezema, D.M. ; Benneker, F.B.G. ; Norgaard, K.; Kroon, J.K. M.; Bjornholm, T.; Feiters, M.C. ; Rowan, Alan E.; Nolte, R.J.M. Synthesis of multi-porphyrin arrays and study of their self-assembly behaviour at the air-water interface. J. Phys. Org. Chem. 2001, 14, 501-512. Samori, P.; Engelkamp, H.; de Witte, P.; Rowan, A.E. ; Nolte, R.J.M. ; Rabe, J.P. Self-assembly and manipulation of crown ether phthalocyanines at the gel-graphite interface. Angew. Chem., Int. Ed. 2001, 40, 2348-2350. Cornelissen, J.J.L.M. ; Donners, J.J.J.M. ; de Gelder, R.; Graswinckel, W. S.; Metselaar, G.A. ; Rowan, A.E. ; Sommerdijk, N.A.J.M. ; Nolte, R.J.M. b-Helical polymers from isocyanopeptides’ Science 2001, 293, 676-680. Cornelissen, J.J.L.M. ; Rowan, A.E. ; Nolte, R.J.M. ; Sommerdijk, N.A.J.M. Chiral Architectures from Macromolecular Building Blocks. Chem. Rev. 2001, 101, 4039-4070. R.J.M. Nolte, A.E. Rowan, M.C. Feiters, P.J. Buynsters, J.L.L.M. Cornelissen, J.J.L.M. Hannink, N.A.J.M. Sommerdijk, Helical Molecular Programming, Poly. Prepr. A.C.S. 2000, 41, 889. J.L.L.M. Cornelissen, W.S. Graswinckel, A.E. Rowan, R. De Gelder, N.A.J.M. Sommerdijk, R.J.M. Nolte, Artificial beta-sheet helices, Poly. Prepr. A.C.S. 2000, 41, 943-954. P. Foubert, P. Vanoppen, Michel Martin, T. Gensch, J. Horkens, A. Helser, A. Seeger, R.M. Taylor, A.E. Rowan, R.J.M. Nolte, F.C. De Schryver, Mechanical and Optical Manipulation of Porphyrin Rings at the Submicron Scale, Nanotechnology 2000, 11, 16-23. K. Yabuuchi, A.E. Rowan, R.J.M. Nolte, T. Kato, Liquid-Crystalline Physcial Gels: Self-aggregation of a Gluconamide derivative in Mesogenic molecules for the formation of Anisotropic Functional composites, Chem. Mater. 2000, 12, 440-443. S.J. Holder, J.A.A.W. Elemans, A.E. Rowan, R.J.M. Nolte Host-Guest complexes with tunable solid state structures, Chem. Commun., 2000, 355-356. M.C. Feiters, A.E. Rowan, R.J.M. Nolte, From Simple to Supramolecular Cytochrome P-450 Mimics, Chem.Soc.Rev., 2000, 29, 375. A.P.H.J. Schenning, B.Escouder, J.L.M. van Nunen, B. de Bruin, A.E. Rowan, S. J. van der Gaast, M.C. Feiters, R.J.M. Nolte, ‘Synthesis, Aggregation and Binding Behaviour of Synthetic Amphiphilic Receptors, J. Org. Chem. 2001, 66, 1538–1547. J.A.A.W. Elemans, A.E. Rowan and R.J.M. Nolte, ‘Self-assembled Architectures from Glycoluril’ Ind. Eng. Chem. Res. 2000, 39, 3419. Bisson, Adrian P.; Carver, Fiona J.; Eggleston, Drake S.; Haltiwanger, R. Curtis; Hunter, Christopher A.; Livingstone, David L.; McCabe, James F.; Rotger, Carmen; Rowan, Alan E. Synthesis and Recognition Properties of Aromatic Amide Oligomers: Molecular Zippers. J. Am. Chem. Soc. 2000, 122(37), 8856-8868. Elemans, Johannes A. A. W.; Bijsterveld, Edward J. A.; Rowan, Alan E.; Nolte, Roeland J. M. A host-guest epoxidation catalyst with enhanced activity and stability. Chem. Commun. 2000, (24), 2443-2444. G. Schweitzer; G. De-Belder; L. Latterini; Y. Karni; A.E. Rowan; R.J.M Nolte; F.C De-Schryver, Dynamic process in a hexameric benzo-porphyrin studied by femtosecond transient absorption Chem Phys Lett. 1999; 303: 261-267. L. Latterini; R. Blossey; J. Hofkens; P. Vanoppen; F.C. De-Schryver; A.E. Rowan; R.J.M Nolte, Ring formation in evaporating porphyrin derivative solutions, Langmuir 1999; 15, 3582-3588. A.E. Rowan, R.J.M. Nolte, Macromolecular Porphyrin Architectures, Polym. Mater. Sci. Eng. 1999, 80, 35. J.N.H. Reek, A.E. Rowan; M.J. Crossley; R.J.M. Nolte, Synthesis and photophysical properties of porphyrin-functionalized molecular clips, J. Org Chem. 1999, 64, 6653-6663. J.A.A.W.Elemans; M.B. Claase; P.P.M Aarts; A.E. Rowan; A.P.H.J. Schenning; R.J.M. Nolte Porphyrin clips derived from diphenylglycoluril. Synthesis, conformational analysis, and binding properties J. Org Chem. 1999, 64, 7009-7016. A.E. Rowan; J.A.A.W.Elemans; R.J.M. Nolte, Molecular and Supramolecular Objects from Glycoluril, Acc.Chem Res, 1999, 32, 995-1006. R.J. Jansen, A.E. Rowan, R. de Gelder, H.W. Scheeren, and R.J.M. Nolte, Synthesis, X-ray structure and binding properties of molecular clips based on dimethylpropanediurea, Chem. Commun. 1998 121. A.E. Rowan and R.J.M. Nolte, Helical Molecular Programming, Angew. Chem. Int. Ed. Engl. 1998, 37 63. A.E. Rowan, P.P.M. Aarts, K.W.M. Koutstaal, Novel porphyrin-viologen rotaxanes, Chem. Commun. 1998, 611. J.N.H. Reek, H. Engelkamp, A.E. Rowan, J.A.A.W. Elemans, and R.J.M. Nolte, Conformational behavior and binding properties of naphthalene-walled clips, Chem. Eur. J. 1998, 4, 716. J.A.A.W. Elemans, R. de Gelder, A.E. Rowan and R.J.M. Nolte, Bipyridine functionalized molecular clips. Self-assembly of their ruthenium complexes in water, Chem. Commun. 1998, 1553. F. Venema; H.F.M. Nelissen; P. Berthault; N. Birlirakis; A.E. Rowan; M.C. Feiters; R.J.M. Nolte. Synthesis, conformation, and binding properties of cyclodextrin homo- and heterodimers connected through their secondary sides Chem. Eur. J. 1998; 4 2237-2250. H.A.M. Biemans, A.E. Rowan, A. Verhoeven, P. Vanoppen, L. Latterini, J. Foekema, A.P.H.J. Schenning, E.W. Meijer, F.C. de Schrijver and R.J.M. Nolte, Hexakis porphyrinato benzenes. A new class of porphyrin arrays, J. Am. Chem. Soc., 1998, 11054. R.J.H. Hafkamp, B.P.A. Kokke, I.M. Danke, H.P.M. Geurts, A.E. Rowan, M.C. Feiters, and R.J.M. Nolte, Organogel formation and molecular imprinting by functionalized gluconamides and their metal complexes, Chem. Commun. 1997, 545. J.N.H. Reek, A.E. Rowan, R. de Gelder, P.T. Beurskens, M.J. Crossley, S. de Feyter, F. de Schryver and R.J.M. Nolte, Novel cleft-containing porphyrins as models for studying electron transfer processes, Angew. Chem. Int. Ed. Engl. 1997, 36,361. A.E. Rowan, N.A.J.M. Sommerdijk, J.N.H. Reek, B. Zwanenburg, M.C. Feiters and R.J.M. Nolte, Design and construction of supramolecular and macromolecular architectures by tandem interactions, Macromol. Symp. 1997, 117, 291. J.N.H. Reek, A.H. Priem, H. Engelkamp, A.E. Rowan, J.A.A.W. Elemans, and R.J.M. Nolte, “Binding features of molecular clips. Separation of the effects of hydrogen bonding and p-p interactions” J. Am. Chem. Soc. 1997, 119, 9956. Hofkens, L. Latterini, P. Vanoppen, H. Faes, K. Jeuris, S. De Feyter, J. Kerimo, P.F. Barbara, F.C. De Schrijver, A.E. Rowan and R.J.M. Nolte, Mesostructure of evaporated porphyrin thin films: porphyrin wheel formation, J. Phys. Chem. B 1997, 101, 10588. F. Venema, A.E. Rowan and R.J.M. Nolte, 'Binding of Porphyrins in Cyclodextrins' J. Am. Chem.Soc., 1996, 118, 250-252. N.E. Brasch, C. Clarke, D.A. Buckingham and A.E.Rowan, O17 NMR line broadening and T-1, T2 measurements on CrO42- and HCrO4- J.Aus.Chem., 1996, 567. A.P.H.J. Schenning, B. de Bruin, A.E. Rowan, H. Kooijman, A.L. Spek and R.J.M. Nolte ' Strong binding of Paraquat and Polymeric Paraquat Derivatives by Basket Shaped Hosts' Angew. Chem. Int. Ed. Engl. 1995, 34, 2132-2134. P.A. Brooksby, C.A. Hunter, A.J. Mcquillan, D.H. Purvis, H. Duncan, A.E. Rowan, R.J. Shannon and R. Walsh, 'Supramolecular Activation of p-Benzoquinone' Angew. Chem. Int. Ed. Engl. 1994, 106, 2489-2492. R.J. Abraham, A.E. Rowan, N.W. Smith and K.E. Smith, N.M.R. 'Spectra of Porphyrins part 42. The synthesis and aggregation behaviour of some Chlorophyll analogs' J.Chem.Soc., Perkin Trans II, 1993, 6, 1047-1059. R.J. Abraham, A.E. Rowan, J.M. Bakke and J.E. Broeden, 'Conformational Analysis Part 16. A lanthanide induced shift (L.I.S.) investigation of the conformation of bicyclo[5.2.1]deca 2,6-dione, J.Chem.Soc., Perkin Trans II, 1991, 1471-1475. R.J. Abraham, A.E. Rowan and K.E. Smith, 'N.M.R. Spectra of Porphyrins part 40. Self-Aggregation in Zinc(II) and Nickel(II) porphyrins' J.Chem.Soc., Perkin Trans II, 1991, 515-521. A.E. Rowan ‘NMR studies of molecular structure in solution’ Ph D. Thesis, University of Liverpool, 1990, 275 pp. R.J. Abraham, A.P. Barlow and A.E. Rowan, 'Substituent Chemical Shifts in N.M.R. Part 4. 1H SCS in some 2-substituted norbornanes and bornanes' Magn.Reson.Chem., 1989, 27, 1074-1084. Nolte, R.J.M. ; Rowan, A.E. Bio-Inspired Polymer Chemistry. Tuning the Structure and Properties of Self-Assembled Polymers by Solvent Interactions, Macromol. Symp., (2016), 369, 97–100. Miller, R. D.; Sly, J.; Lee, V. Y.; Appel, E.; Tijo, M.; Nguyen, T.; Nunes, H.; Gomez, L.; McNeil, M.; Munninghoff, J.; Rowan.A.E. Nanogel star polymer nanostructures of controlled size, molecular architecture and functionality: No assembly required. Ed. Laudon, Matthew; Romanowicz, Bart, Nanotech Conference & Expo 2012: An Interdisciplinary Integrative Forum on Nanotechnology, Microtechnology, Biotechnology and Cleantechnology USA, June 18-21, 2012 (2012), 1, 464-467. Kampert, E.; Russcher, J. C.; Boukhvalov, D. W.; Janssen, F. F. B. J.; Smits, J. M. M.; de Gelder, R.; de Bruin, B.; Christianen, P. C. M.; Rowan, A. E.; Katsnelson, M. I.; Maan, J. C.; Zeitler, U. Antiferromagnetic interactions in a distorted cubane-type tetranuclear manganese cluster. Journal of Physics: Conference Series (2010), 200. P. Thordarson, R.J.M. Nolte, A.E. Rowan, in The Porphyrin Handbook II Vol 18, Chapter 115: ‘Self-assembly of Chiral Phthalocyanines and Chiral Crown Ether phthalocyanines’ eds: K. M. Kadish, K.M. Smith, R. Guilard, Academic Press, Amsterdam, 2003, p 281-302. A.E. Rowan, M.C Feiters, R.J.M. Nolte Supramolecular Chemistry and Adhesion’ Proc. Annu. Meet. Adhes. Soc. 1997, 271-273. A.E. Rowan, J.L.M. van Nunen, A.P.H.J. Schenning and R.J.M. Nolte, Modification of the Physical Properties of Polymers by Supramolecular Interactions' Macromolecular Symposia 1996, 102, 217-224.